1) As befits one of America's premiere artists, Aretha Franklin sang at three Presidential inaugurations. The first was Jimmy Carter's in 1977, when she sang "God Bless America." What's your favorite patriotic song? "The Star Spangled Banner"...there is just something comforting about that song to me. 2) The daughter of a Baptist minister, Aretha grew up with church music. She told Rolling Stone one of her favorite songs was the hymn, "Victory Is Mine." What's your favorite religious song? "How Great Thou Art", it makes me cry every time I hear it. The Elvis version specifically makes me cry. 3) She welled up a bit when President George H. W. Bush presented her with the nation's highest civilian award, the Presidential Medal of Freedom in 2005. When is the last time you shed a tear? I cry at silly times, so probably during a movie or something, I can't remember. I also cry when I am mad, but I haven't been that mad in a while. 4) In 1980, the Queen of Soul sang for the Queen of England in a Command Performance at The Royal Albert Hall. Have you ever been to London? no, but I would love to go! 5) Since Aretha had many honorary degrees, it would have been appropriate to refer to her as Dr. Franklin. Who is the last person you referred to by his or her title (Officer, Father, Sgt., Dr., etc.)? probably my chiropractor, he was the most recent doctor I saw and I saw a lot over the summer. I try to get them out of the way, so I do not have to take off work. 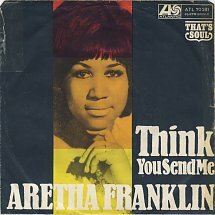 6) In this week's song, Aretha tells her lover that it doesn't take a high IQ to understand what's going on in their relationship. Do you know your IQ? I actually do. 7) A sculpture of Aretha is on display at Madame Tussaud's in New York. Do you think wax museums are cool, or creepy? I have never been to a wax museum, but I would think cool. 8) Aretha and Motown legend Smokey Robinson were literally lifelong friends, since they were playground buddies in Detroit. Smokey is one of the only people who can claim to have seen The Queen of Soul with a bucket in a sandbox. If we went to the playground today, would you head for the swings, the slide or the jungle gym? Or, like Aretha, would you play in the sand? swings! I teach preschool and I still love the swings! They were always my favorite as a kid. I do not like to go high now though, it makes me dizzy. 9) Random question: Do you like pumpkin seeds? This is crazy, but I have only had them once, but yes...I do like them! I don't cry often in real life, but like you, I can turn on the water works during movies. Swings still hold an allure for me, too. Another swing fan, here, too. I wonder though--I get bouts of vertigo now that I'm older, I wonder how I would fare on swings. I do like the Elvis version of How Great Thou Art, as well. I just decided to go with something a little different today. I'm not much of a crier, like the Gal said, in real life, but movies can make me tear up , not bawl, but shed a tear or two. I hope the school year is going well so far! There is comfort in a swing, I think. That simple back and forth. I'm totally a swings person too! This was such a fun meme today and I've so enjoyed everyone's answers. It's always interesting to see how everyone answers them. Happy rest of the weekend! Lots of swing people in the blogging community! That's cuz we are so cool ;). I enjoyed reading your answers and getting to know you better. Not many for the sand box. ;o) It must be that stray cat thing.. Loved your answers and, yes, I cry just as much when I'm happy and angry as when I'm sad. I won't let myself cry most of the time over sad things. This one got to me though. I just cried the other day while watching a video on Facebook where the bride was marring a deaf man and she was signing her love. The name of the video is "Bride signs wedding song to her deaf husband"